I really love how this quilt has come together, it’s a very simple layout and the hand stitching will be very simple as well. Each of my blocks finish at 10″ with 4″ sashing on each side, the final dimensions for this quilt are 60″ wide by 74″ long, a great size for a twin bed or lap quilt. I have to thank Sharon Schamber for teaching me a whole new way of accurate piecing, I used this video to create the stars and my Grandmother’s quilt for inspiration. If you’re interested in trying a y-seam star, you don’t need a lot of fabric and if you’ve done some garment sewing, it’s not difficult at all. I’m not sure what my next project will be but I have to quilt some quilts before I make another quilt top! I have a few ideas for my next quilt top, last weekend I signed up for the Craftsy class, Scrap Quilting: Big Techniques From Small Scraps taught by Australian quilter Sarah Fielke. She demonstrates a technique I’d never heard of before called Step Down Piecing which looks like fun. Another pattern I’m really attracted to is “Snow Crystals” I discovered in the book “Quilter’s Academy Vol. 4“. This is an excellent book if you’re looking for a real challenge and where I found this block. I’ve since ordered Vol.s 2 and 3 as well. Volume 4 focuses on sewing hexagons, stars and diamonds. It was a complete fluke that I found this book, it was recommended by Amazon for me. Be forewarned, this book does not hold your hand step-by-step but there are a lot of great patterns I’ve wanted to try for awhile. I’m looking forward to building my quilting skills! This entry was posted in Books, quilt and tagged Chicopee fabric, Denyse Schmidt, Flea Market Fancy fabric, Modern Mabel quilt top, Quilter's Academy by Tabatha. Bookmark the permalink. Hey Tabatha, that turned out great! Those quilts are really beautiful. I’d say you were successful at recreating the quiet beauty of your grandmother’s quilt. Will look for it again when it’s quilted. I meant “those STARS are really beautiful.”…Small typo! What a lovely quilt top, very pretty! Tabatha, another amazing quilt. Have you been able to get quilting with your new machine yet? Your quilt turned out beautifully — and I have to thank you for drawing my attention to the fact that Sarah Fielke has a craftsy class! I just signed up…it’s so fun to see her in action, especially since some of her methods are easier to grasp from video than they are from print. I love the look of your stars and am completely impressed that they were done with y-seams. 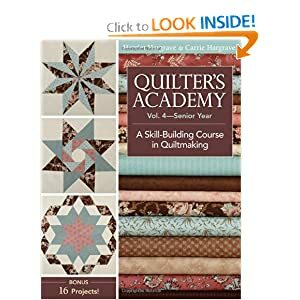 I’ve also been looking at the Quilter’s Academy Series on Amazon, so thanks for the recommendation. Good luck with choosing your next project — so many choices! Oooh, it looks great, Tabatha! I can’t wait to see what you do with the quilting. Beautiful! The sashes really highlight the stars too 🙂 Have a great weekend! Beautiful Stars Tabatha. Perfect Piecing too! I also love the “Snow Crystals” design in the Quilters Academy level 4 too! Love this star quilt! Stars are my weakness. Thanks for the book title too – looks like a great one.